Great news to Malaysia’s gamers and explorers alike, because something great has made its way to town! If you have paid a visit to Mid Valley Megamall as of late, you’ll most probably come across The Rift– Malaysia’s very first Virtual Reality(VR)/Augmented Reality(AR) theme park. The Rift is Malaysia’s first hybrid reality park, blurring the lines between the virtual and physical world. The Rift comes with a catchy tagline- Enter The Rift, Exit Reality. All in all, The Rift hopes to provide exciting virtual adventures for the adults and kids. The Rift provides 15 different reality-altering, physically-challenging experiences, from virtual free-roaming shooters to physical vertigo-inducing wall climbs and free-falls. 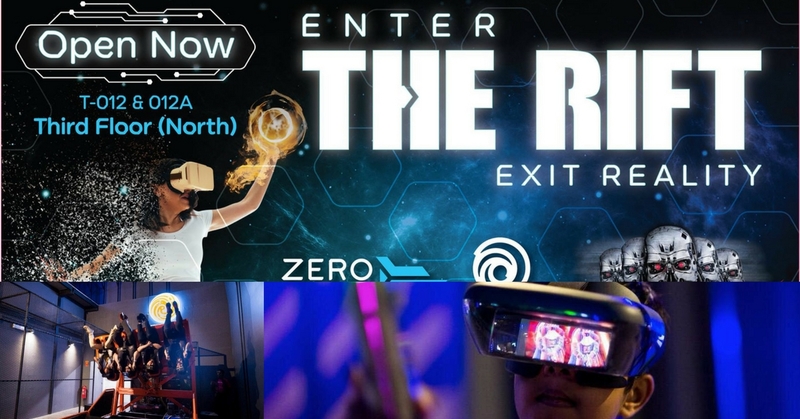 There are a couple of famous attractions to enhance your overall VR adventures, such as race to solve problems, fight off aliens, or struggle against zombies for survival together with your team in the Zero Latency. TERMINATOR X laser battle is another stimulating game where you can battle to save the world from a dystopian future against the machines or another team. There are a few packages available for selection at The Rift. The complete package is priced at RM98, which allows access to 11 attractions, included VR Adventure, Motion Blaster, RaceRoom, Hado PvP, Hado Monster Battle, HoloDek, Zero Latency, and more. Apart from The Rift’s complete package, visitors can also consider the Exit Reality package, which includes The Rift complete package’s attractions (except for Zero Latency). The Exit Reality is price RM55 (NP: RM68). The Rift also provides Junior Reality package for visitors aged between 7 to 11. The Junior Reality package is price at RM30 (normal price- RM52). This package includes HoloWall, Hado Monster Battle, Motion Blaster and HoloDek. If you’ve already been to The Rift, feel free to share us your experience at the comment box below!